This unique workplace approved course is specifically designed for applicants that are looking to renew previously acquired, and still current, emergency first aid and cardiopulmonary resuscitation awards. This course is less expensive and is significantly shorter when compared with the original emergency first-aid program. Cardiopulmonary resuscitation re-certification is provided within this program and applicants may pick either CPR level “A” or “C” to partner with the course. The award from this renewal course is of equal merit compared towards the initial cert applicants attain. Before registering applicants have to fulfil the prerequisite requirements stated on this page. To register for a re-certification training course choose the course location, date and time within the wide variety down the page. This course is offered at the cheapest costs and also in the best facilities within Halifax. Have successfully completed an emergency first-aid program (or re-certification course) through a legitimate Canadian carrier like St Mark James, St. Johns Ambulance, Lifesaving Society or Heart and Stroke Foundation. However, if participants don’t fulfill both of these prerequisites they have to re-do the full course. The cost of an emergency first aid and CPR A re-certification course is — dollars. 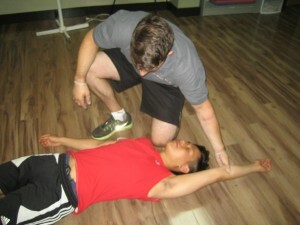 Customers can partner the program with CPR level “C” training for — dollars. The duration of the renewal program is 8 hours as dictated through St Mark James. Individuals can not complete the course prior to 8 hours. Individuals that meet the skills and test specifications for the class immediately receive a St Mark James emergency 1st aid re-cert card. This particular award fulfills numerous school, workplace and federal conditions. Private emergency first-aid refresher training courses are readily available. Please contact us via telephone or e-mail to schedule a private re-certification course. To enroll for a emergency first aid and cardiopulmonary resuscitation renewal class in Kelowna pick the location, date and time of the program that suits your schedule from the selection listed below. Fill in the registration to confirm a place within the course.